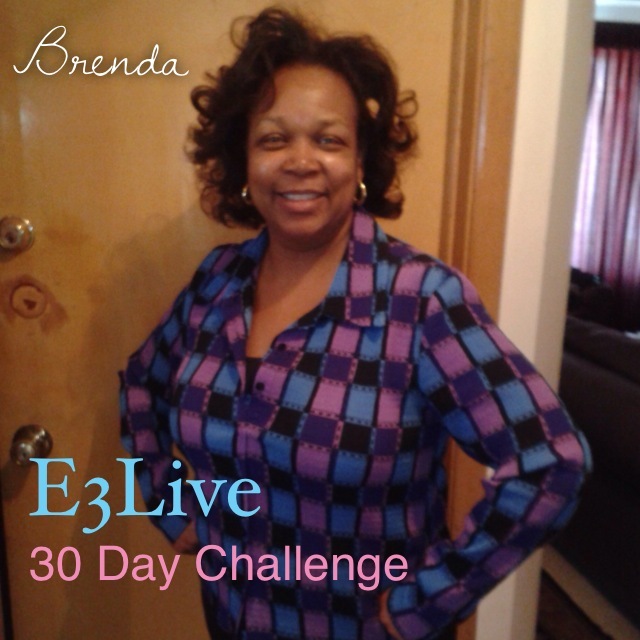 Fifty-five year old Brenda just finished her E3Live 30 Day Challenge! Congratulations Brenda! She says: “I have to say I am very grateful for being a part of this 30 day challenge. I feel RENEWED! Honestly I do. It’s been fun but it has also been life-changing. I will be an E3Live supporter for life and will continue to take the products. I can’t go back to where I came from! I must keep moving forward and I will.” Brenda took E3Live + BrainON and also E3 RenewMe for 30 days. Yay Brenda! Thursday-Day 27 -Mixed 2 1⁄2 oz of BrainOn with banana/strawberry smoothie 7am before work Friday-Day 28- Mixed 3oz of BrainOn with banana/strawberry smoothie 7am before work Saturday-Day 29 – Drank 3oz of BrainOn around 5am! Sunday-Day 30-Mixed about 3oz of BrainOn with a delicious green smoothie around 9am before a bootcamp class. I rocked that class….! Saturday-Took 3 RenewMe capsules with lunch around 1pm. When I take a RenewMe capsules, they give me the boost I need to get through the afternoon! Sunday- Took 3 RenewMe capsules with lunch around noon. Monday- Took 3 RenewMe capsules with lunch around 1pm. Saturday-Feeling good! Sunday-Feeling great! Monday-Speedy recoveries after I work out! I love it! Tuesday-OMG! I am excited about life! Wednesday-Feeling RENEWED! Thursday-I had an all day committee meeting today and usually these meetings wear me out to the point I can hardly move when they are over. Not this time! When the meeting was over I had some extra energy to spare………..I owe it all to E3Live…Oh yes!! Friday-What can I say….feeling great! Saturday-Today I started my day EARLY with lots of running around and chores to take care of. Thank God for the E3Live products that got me through! Sunday – I feel like a RENEWED WOMAN! I am approaching the last day of this 30 day challenge and I feel amazing! I am stronger with a new level of energy, I am sleeping so much better, my bowel movements are with ease (TMI), getting lots of compliments on my skin, mental clarity and everything just feels right and on point! For the entire week, I HAVE BEEN FEELING AMAZING LATELY……….wonder why…LOL! I am very happy to say I am down 4 pds from when I started this challenge. I haven’t measured myself but I’m sure I’ve lost some inches. My appetite did change. I was getting fuller quicker than usual which made me eat smaller portions. Overall, I am a RENEWED WOMAN with a RENEWED outlook on life! Here is Week 2 for Brenda – Go Brenda! WOW! I am super excited I made it through my first week. I have to share with you that it was a bit challenging week. My body detoxed for about 4 days and then I got a really bad cold that I felt almost took me to another bad level. In reality, I believe it was all related to the detoxing but I’m so new to this, I couldn’t really say that with any certainty. I’m going to journal a little different this week. I am really geared up this week and believing for some wonderful experiences so my journaling in tell a story! Woke up EARLY this morning, still feeling weak from the detox, but went straight for the E3Live with no hesitation and downed a shot glass quickly. Still adjusting to the taste but I do know what’s good for you may not always taste good to you. I am participating in my church’s running club so I went to a meeting at 7am and couldn’t wait to share with some of the runners the good news about what I’m doing with E3Live and the challenge. I usually eat more relaxed on the weekends but I’m finding that my system is not having some of the junk food I want to give it. So I’m okay with that (I think)! It’s forcing me to eat healthier. Took my 2 RenewMe capsules after lunch. I did rest most of the day because I’m still working on something with my body. Ahhhhh………good things come on a Sunday morning! Woke up bright and early for morning prayer and to prepare for church and wouldn’t you know it…….had a shot of E3Live. It’s becoming an important part of my morning routine now. In my opinion this is the routine among routines to have. I’m slowing gaining back my strength and starting to feel okay again. Nothing different about my Sunday. It’s usually a low key day. I love my low key days because some times that is just what I need. Took my 2 RenewMe capsules after lunch. 6am – I mixed a shot glass full of E3Live with my kale and berries smoothie……yum! yum! It’s amazing how the E3Live blends in and adds a very unique and healthy taste to an already amazing drink! I love it. Went for a 30 minute brisk walk for lunch and felt energized and pumped up afterwards. Took my 2 RenewMe capsules after my walk along with lunch. I baked some chicken for dinner and tossed a leafy green salad to go with it. I thought I’d be really hungry after that because it just seems wrong to not have a cookie or something sweet on the side but to my surprise, I was full! And that was it for my start of the week. Looking ahead to what the rest of the week will bring! 5am – took my shot of E3Live straight this morning before my 5:30 cycling class! Wanted to get it in there quick and without interruption. I must say I’m getting better with the cycling. I don’t get winded as quickly and I am really starting to enjoy the class. Day 11 and I’m feeling mighty nice about this entire 30 day challenge. My husband and I were invited to enjoy a 21 day trial membership at an upscale health club facility in Chicago. Talk about blessings chasing you down……yes lord……that is exactly how it’s been happening with me lately. First, I’m selected for this 30 day challenge with E3Live. I got all the products free. All they want me to do is take them daily and tell them how I feel! What?! God is so awesome. Then, I’m selected for a 21 day free trial membership at one of the best health club facilities in Chicago!!!! All I can say right now is WOW! Needless to say, I worked out after work. On a normal day (without E3Live), I would be wore out right now BUT all thanks to E3Live I am energized to go some more. It’s an absolutely phenomenal feeling! Still taking 2 RenewMe pills with lunch. 5am – took my shot of E3Live straight this morning before my 6am workout! I am in full swing training for my Half Marathon! What a perfect time to be taking E3Live and RenewMe. I’m a firm believer that timing is everything so in my situation the TIMING of this challenge is perfect. Just what the doctor ordered! Friday, April 11 – Day 14th Good morning Family! I am one day away from my 55 birthday and I am feeling better than I’ve felt in a long time! God is so good! I feel so blessed in so many ways. One I have a husband and daughter who loves me unconditionally. I have good health and I love myself and my body and that is why I accepted this 30 day challenge with an open mind and an open heart. I plan to live a very long time in good health and wellness. I plan to live a long and strong life for my grandchildren (although I’m not looking for any no time soon….still waiting for the right man to come into my daughter’s life)! Anyway, for this second week I feel I won a nobel prize! I took my E3Live Brain On drink and RenewMe capsules FAITHFULLY everyday and on time. The taste is getting better and better which means I can take a little more each day. Isn’t that wonderful?! I am ending this week feeling great, looking gorgeous and thanking God for his love for me. Another year, another birthday, another chance at life in it’s fullness. Until next time……..Love and Peace to everyone! 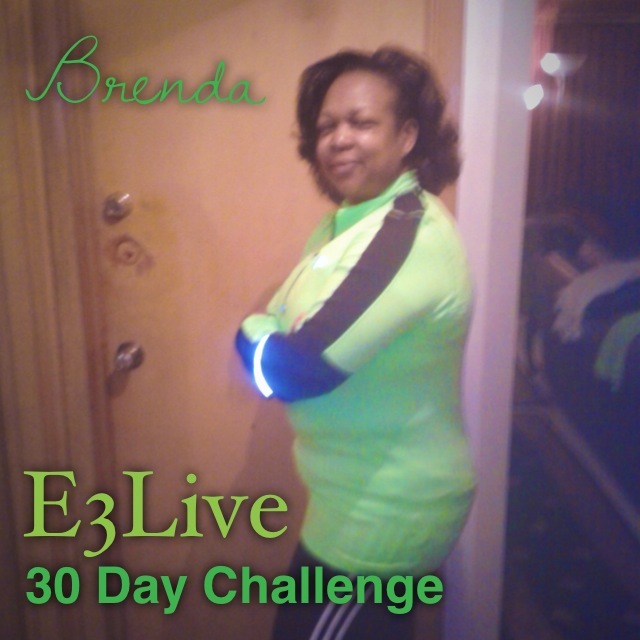 Brenda has just finished the first week of her E3Live 30 Day Challenge! She is taking fresh-frozen BrainON and also E3 RenewMe. She’s incorporating more fruits and veggies into her diet and going on speed walks and to cycling class. Sunday-Now I’m starting to notice a little more energy than usual. Nothing mentally or emotionally yet. Monday-I am starting to feel some good results physically. My 30 minute walk was so refreshing. Overall I am an upbeat person so no change mentally or emotionally yet. Tuesday-OMG! I am excited about my new-found energy level! Wednesday-OMG! Today is totally different….I feel sluggish. I believe it’s part of my system detoxing. Not a good feeling! Thursday-Feeling a heck-ova-lot better today! Whew! Friday-Kinda feeling like I felt Wednesday. Checked my blood pressure and it’s high so that may have something to do with why I’m not feeling my best. 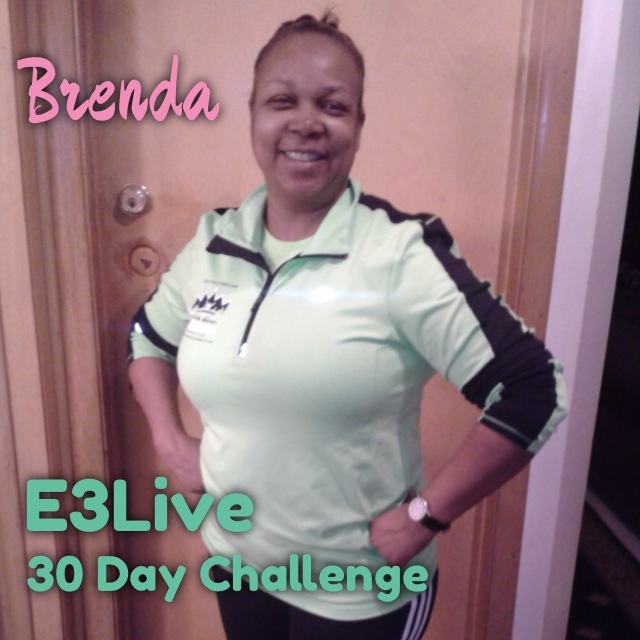 E3Live 30 Day Challenge – Meet Brenda! 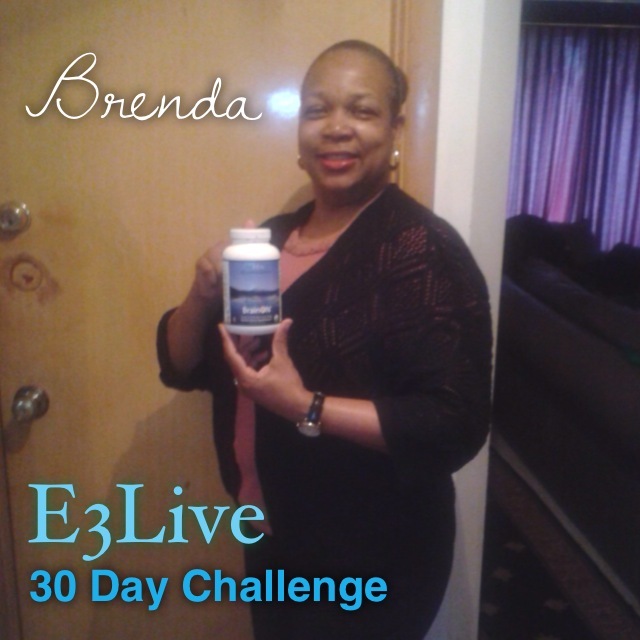 Meet Brenda – she is 55 years old will be taking E3Live BrainON and E3RenewMe for 30 days! 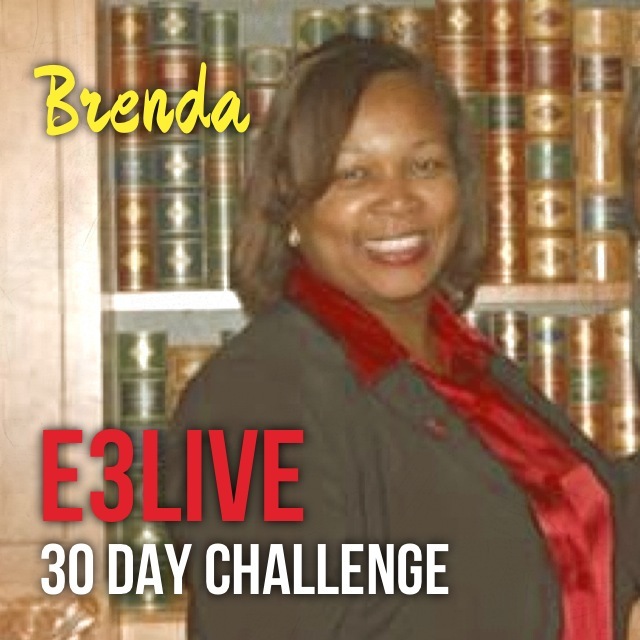 Watch Brenda’s video at the start of her challenge: E3Live 30 Day Challenge – Meet Brenda! Brenda is training for a 1/2 marathon! She is looking for vibrant energy, to get her memory on point and wants to achieve good health and wellness.